So much has happened in little Jameson’s growth and development since the last update. He started crawling a couple of days after his 6 month birthday. 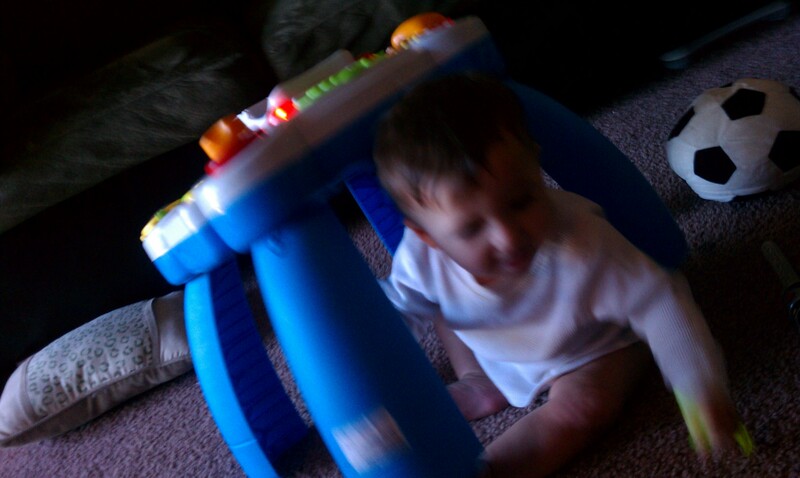 He is now a crawling machine. He is into everything! He is such an explorer—and his mission? To find the smallest, most random items in places you’d never think of looking and stick them in his mouth. He crawls under chairs, into trashcans, and onto whatever he can climb. He started pulling himself up to standing position within a couple of weeks of crawling. So we pulled out the little activity table we bought at a consignment store that plays music and has all sorts of fun gadgets on it. He loves it. 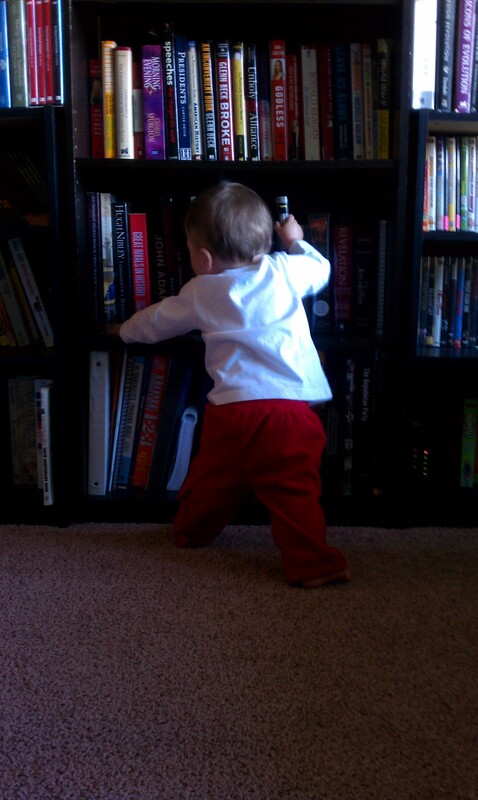 But that doesn’t stop him from pulling himself up on bookshelves, the couch, his crib, our bed, the cupboards, you name it. He cut his first tooth while we were in Utah for Christmas. He is cutting his second tooth as we speak. Boy is he a fussy baby when cutting a tooth. He has been teething for a couple of months as little pearls have been showing up under his gums all over his mouth. I thought for sure he was cross cutting first because his canines started to bulge and a little white bump showed up at the base of his gums in both bottom canine areas, but that was it. I’m starting to wonder if the bumps are just swollen salivary glands or something else. Regardless, he cut the traditional bottom two teeth. Still haven’t got them in a picture yet. Just the tops of them are showing now and he is very protective of them when I try to open his mouth or take a picture of them. He is loving solids now. He has had peas, sweet potatoes, rice, chicken, bananas, oranges, pizza crusts, apples, toddler puffs, and teething bisquits. His absolute favorites are chicken blended with sweet potatoes and also plain ol’ sweet peas. He is babbling for sure and has little words he can say. He says “Mama” when he is really upset and crying. And he says “num-num” when he is eating his favorite solids food. He tried saying “baba” this morning. 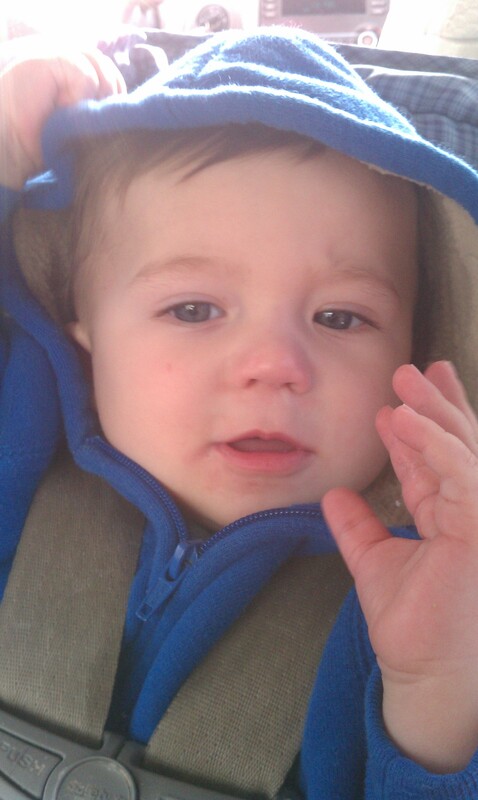 As he was holding his bottle he was saying “bbbbbbbb.” Its just a matter of time. 🙂 He loves to say “ahh-ahh” when he is happy and playing. He will yell it happily, over and over again with a big smile on his face. He absolutely loves to smile and laugh. He is such a happy baby. We are exploring soy formula right now–something I’d never thought I’d do. But Jameson has been congested almost everyday since I started supplementing my breastfeeding with formula when he was 8 days old. And this cold he has now, he has had for a month now (I too have had it this long). Now I know mine sticks around longer because I have allergies, so I wonder if he does too. I’m allergic to cow’s milk and thought maybe cow’s milk formula could be causing his congestion. So I’m slowly introducing him to soy and will see if anything changes for the good. On the downside, he has been constipated since the change, even though the change has been slow. I’m doing only a third soy and two-thirds regular right now. I’m afraid to bump it up to half until I see his bowel movements soften up. I looked it up and found that it could be the transition and then it would go away, but that it could also just be the soy. It does create firmer poop. 😦 So….if the constipation doesn’t go away, I’ll have to jump ship. There are a few recipes online for home-made rice milk formula I might try. But its way more work. I have to buy essential fatty acid drops, infant multivitamin drops, molasses, and a few other things. It seems like it would taste good though. Otherwise, maybe it’s dust. I bought mattress covers that are supposed to suffocate dust mites and still need to put them on all our mattresses. Owen and I are both allergic to dust and dust mites pretty bad so maybe JJ got that gene. So many factors. But I will work on each one and hopefully find the solution. He is so adorable T! 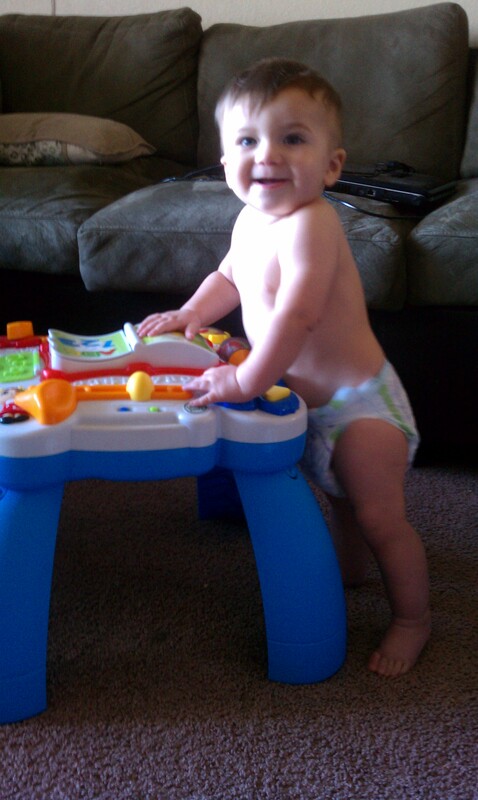 I can’t believe he’s already crawling..wow! Brix still just rolls over (back to tummy) in one direction, can’t roll back over and doesn’t crawl. So he’s very much stuck..hee hee. I’m glad he’s not crawling all over yet!! I’ll keep you in my prayers about the formula situation..that’s a tough one. oh my heart misses that guy already. don’t worry about his lack of weight gain. its kind of normal right now and he is way beyond normal weight gain, lol! gaving didn’t reach 19 lbs until he as almost 28 months! i miss you guys and love to read your posts!